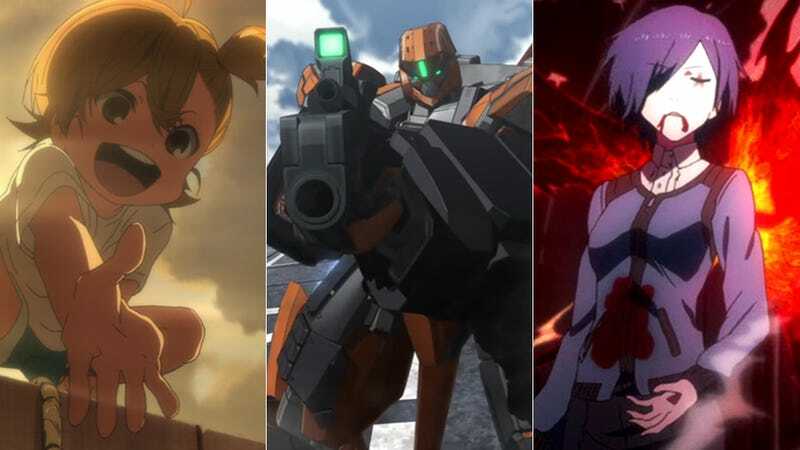 We are now six weeks into the summer anime season, and with 44 new anime on the air it can be more than a little difficult to know which ones to watch. Luckily, we at Kotaku East are here to help with our recommendations. I have spent the last few weeks getting fully caught up on all the most well-recommended new anime from this season (thanks to the readers of TAY and Ani-TAY)—and more than a few other ones that just happened to catch my eye. But before we get to the list, keep in mind as you read that these are simply the new anime that should not be missed this season. There are many more airing currently that are perfectly watchable. These, however, are the cream of the crop. Non-Spoiler Plot Summary: Shortly after transferring schools, Momoka finds herself tricked into joining the “Survival Game Club”—a club full of gun-nut girls (and a cosplayer) who play war games with airsoft guns. But as soon as the club members face her in battle, they discover that Momoka, while new to firearms, is far from the innocent, wide-eyed girl she pretends to be. Why You Should Watch It: Momoka is not a good person—not at all. While on the outside she appears to be an innocent, normal-girl protagonist, on the inside she is more petty and vindictive than most anime villains. Because of this, she is the core of the anime's humor. Simply put, you expect a character filling the role of “innocent newcomer” to act in a certain way—a way Momoka's ego and violent tendencies would never allow. The other source of Sabagebu! 's humor is its repeated destruction of the fourth wall: Every time something happens that might lead the audience to suspend their disbelief, the narrator quickly appears with a rationalization—or at least joins the audience in confusion about how the events taking place are even possible. This constant lampshade hanging is the perfect supplement to the anime and lets you enjoy the absurdity rather than being pulled out of the story by its very existence. Watch It If You Like: Stella Women's Academy, High School Division Class C3, anything full of fourth-wall-breaking humor. Non-Spoiler Plot Summary: After escaping the death game virtual reality MMORPG Sword Art Online, Kirito is trying to move on with a normal life. However, rumors arise that if the mysterious player “Death Gun” shoots you in VRFPS Gun Gale Online, you'll then die in real life. So Kirito is hired to enter GGO and discover if it's true or not by becoming a target himself. Why You Should Watch It: Basically, Sword Art Online II is a cyberpunk murder mystery where Kirito must discover not only if there really are murders taking place from within the game, but also, if so, how? Moreover, everything is taking place in an unfamiliar virtual world where literally anyone could be “Death Gun” in disguise. The other aspect that makes this anime worth watching is the new character, Shinon. She is a psychologically damaged young woman who is trying to deal with the complex trauma of having taken a human life. By the act of conquering the strongest players of Gun Gale Online, she hopes to take control of her life in the real world. She is an interesting and mufti-faceted character—especially when paired with Kirito who has also killed people to protect those he loves. Watch It If You Like: Sword Art Online, Accel World, Psycho Pass. Non-Spoiler Plot Summary: After the Apollo astronauts discovered a hyper-gate connecting the Moon to Mars, the red planet was colonized. In the years that followed, the two planets warred—with the fighting ultimately ending in a stalemate and the moon shattered. But now, after a decade-long ceasefire, the assassination of the Martian princess brings the war back to Earth—and with the superior mecha technology of Mars, it looks to be a war the Terrans have no chance of winning. Why You Should Watch It: When it comes down to it, Aldnoah.Zero is Gundam where the main characters don’t have a Gundam but are instead forced to fight against Gundams with horribly inferior mecha. Thus, this is an anime where intelligence and quick thinking trumps raw power in battle, and the heroes always seem at a near-fatal disadvantage. And while there are many of the typical mecha anime clichés present in this series, they are always tweaked slightly or played with in some way to make them seem new or interesting—something not so surprising considering the fact that the series creator is also the man who wrote Madoka Magica and Psycho Pass. Non-Spoiler Plot Summary: After punching a gallery owner for criticizing his art, calligrapher Handa goes into pseudo-exile on a small rural island off the coast of Japan. There he meets a six-year-old girl named Naru who slowly (and unintentionally) teaches him that there is more to life than suffering for your art. Why You Should Watch It: Barakamon is a story of personal growth and discovery. It is about what happens when you focus on something so intently that you stifle it. Thus, by being in a place where he can't simply lock himself away from the community—especially when being pestered by a precocious six-year-old—Handa is little by little able to reconnect with his art and develop a style that features not only superb technique but passionate emotion as well. However, by far the most enjoyable part of the anime is Naru herself. She is simply a walking bundle of joy—hilarious in her innocence and profound in her childhood wisdom. Every moment with her on screen is a real treat and the way she plays off of Handa is truly heartwarming. Non-Spoiler Plot Summary: A few weeks ago, everything seemed to be going well for bookish college student Ken: He was doing well in school, hanging out with his best friend, and even had a date with the cute girl who frequents his local coffee shop. But now, after awakening in a hospital following an accident at a construction site, Ken finds that he can no longer eat normal food; the only thing he finds appetizing is the smell of human flesh. Why You Should Watch It: Tokyo Ghoul is a dark and twisted look at a world where human-eating, superpowered “ghouls” live among us—feeding upon us. Through Ken we are able to learn more about their fascinating society—the different groups with their clashing philosophies not only on ghoul existence but on humanity's role as well. Then there is the other side of the story: the emotional one. Ken constantly puts himself in peril by treating this new society as though it were a human one. Thus at every step, Ken is confronted by violent, disturbing truths that wreak an emotional toll on him. But he is not the only one. Many of the other ghouls he encounters face their own emotional struggles when it comes to what they are and what that means for the humans they care about. Now that you've read my recommendations for what anime you should be watching this summer season, you may wonder why your favorite series is absent. There are four potential reasons: (1) I think it is terrible (or at least not quite as good as the five above); (2) it is the second/third/fourth season of an anime and I haven’t seen the first; (3) it is an anime continuing from last season; or (4) it simply didn’t cross my radar. Oh, and if you feel the need for even more anime to watch, be sure to check out the five anime of the spring season you should have watched and our picks for the top five anime of 2013.